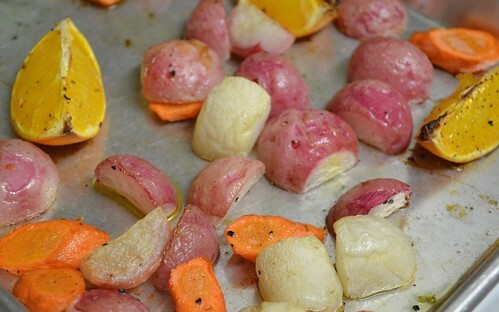 Roasting veggies has pretty much always been one of our winter standbys. It often sings the answer to the question, What to do for dinner? If you put almost any vegetable in a 400-degree oven with a little olive oil and salt, it's hard to go wrong. Of course, with the tiniest bit of forethought, it's pretty easy to enhance the usual flavors and take this meal up a notch or two. 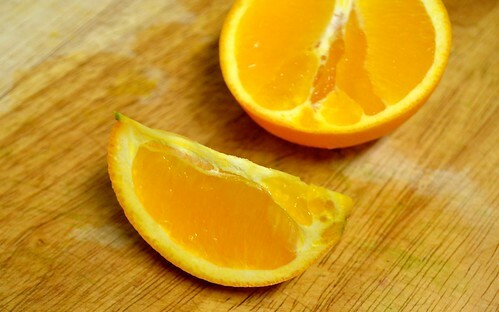 Another great winter staple is citrus fruit. Normally we buy it by the bag, because I have no idea what could be better than a perfectly sweet, tart navel orange. Unless of course it's a blood orange. Or an heirloom orange, which is now in fact a thing. So even though this version might take a little more planning than turning the oven on to let it work its magic, it's still unbelievably simple. You don't have to be too invested in measuring or watching. There are no complicated techniques that will leave you scratching your head or rereading the recipe. Start by preheating your oven to 400 degrees. 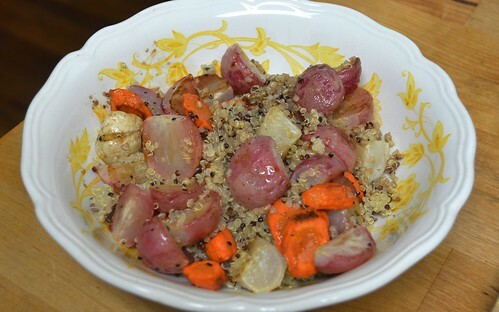 In a large bowl, toss your vegetables together with some olive oil, salt and pepper until evenly coated. 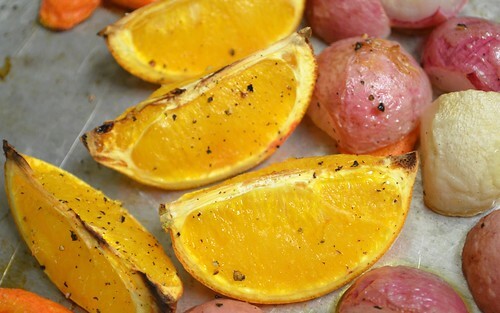 Spread into a single layer on a large aluminum tray or roasting pan, intersperse with orange quarters and pop in the oven for about thirty-forty minutes or until tender. 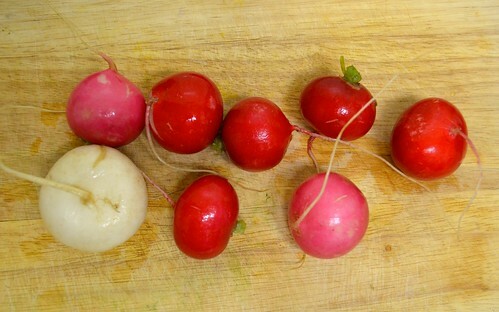 This will vary a little bit depending on the vegetables you choose, but this timeframe usually works for a fork-ready radish. While you're waiting, you can cook your quinoa or chosen grain according to the package directions. 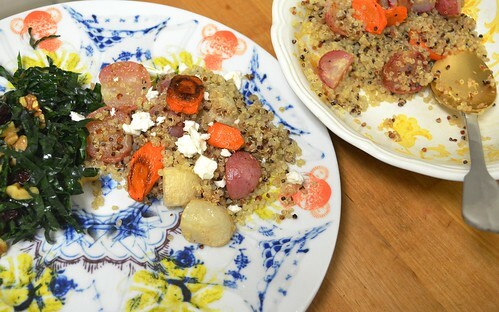 Since quinoa is usually a fast-cooking grain, you could even wait until 15-20 minutes into the roasting process. Once your vegetables are looking gloriously caramelized and slice easily with a knife, remove from the oven. First removing the orange slices (carefully), return the veggies to the bowl in which they were originally tossed. In a small separate bowl (or right on top of the veggies, if you're not that into doing dishes) add your balsamic vinegar and a little more olive oil if needed. If your vegetables are already looking pretty glossy, it might be fine to skip this step. Add your grated ginger and garlic and toss (or whisk) together. Finally, squeeze (again, carefully) your roasted oranges over the vegetables. The fruit should be extra juicy due to the cooking time, so goggles, or at least shielding your face with an oven mitt, wouldn't be totally out of the question. Toss again and re-season according to taste.